I had no idea my club was going to renovate our disgusting old weight room / garbage hole over the winter. They threw down 40 thousand euro into this new gym. I had the priveledge to work out in this gym a couple of times around my normal gym's schedule since I've been here. 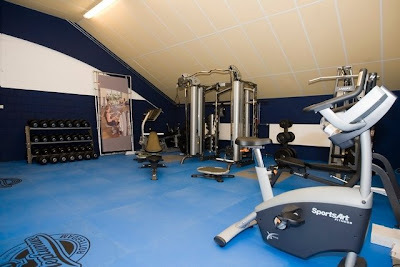 I was able to get in all the excersises I would in a normal gym which was very positive and encouraging. 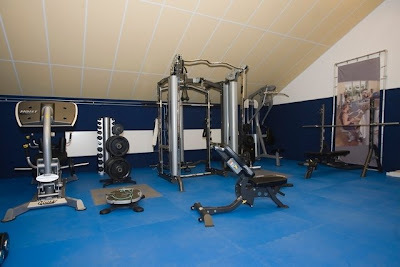 The Universal portion (the tall midle structure in the first picture) can be used for about 1000 different exersises, and is a great addition to any small gym. 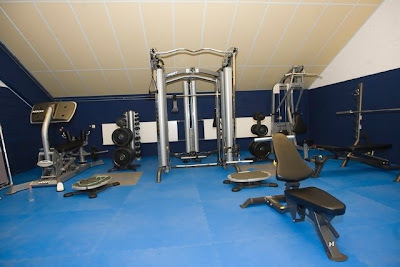 The rubber floor added to this gym is 6000 Euro itself (about 10 K Canadian), and is very very nice. I'm looking forward to weekend workouts in this gym during games I'm not pitching and or practices. A couple of the rubber floor tiles have this printed on them. Only one cardio machine, that being a bike, but that's fine, if I want to run, I run poles anyways.